The penicillins comprise several subgroups of agents with a wide range of bacterial coverage and efficacy. Each penicillin molecule contains a basic β-lactam structure fused to a five-membered ring. Because of their broad spectrum of activity and availability in oral form, the penicillins are commonly used in the treatment of community-acquired pneumonia and have become the drugs of choice in treating many common infections. The penicillins are divided into the following groups: natural penicillins, aminopenicillins, and the extended-spectrum penicillins. The natural penicillins (e.g., penicillin G) have the narrowest spectrum. They are active only against the gram-positive cocci; in community-acquired pneumonia, they are active essentially against S. pneumoniae only. The aminopenicillins (such as ampicillin and amoxicillin) are natural penicillin derivatives that expand the spectrum of activity to include some gram-negative organisms, including H. influenzae strains that do not produce β-lactamases (enzymes that destroy the ring structure of the antibiotic, thereby rendering it ineffective), but not Klebsiella pneumoniae or Pseudomonas aeruginosa. The aminopenicillins have been used since the 1970s, and they continue to be valuable therapeutic agents for the treatment of many bacterial infections. These drugs are sometimes used as first-line agents in the treatment of mild-to-moderate community-acquired pneumonia if no risk factors are apparent. However, the usefulness of aminopenicillins is increasingly limited in countries such as France and Spain because of resistance among the common respiratory pathogens. 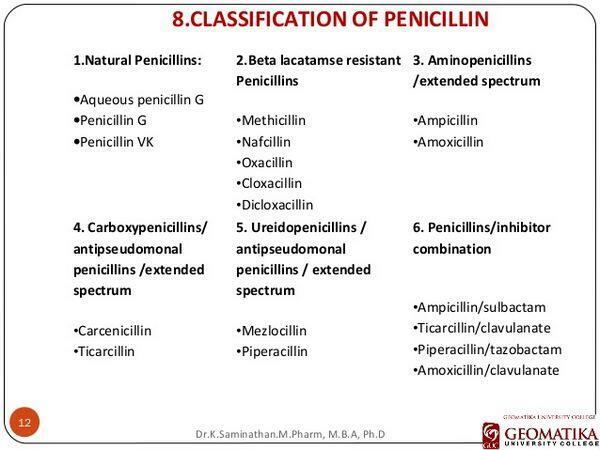 The extended-spectrum penicillins (such as piperacillin and ticarcillin) are also semisynthetic penicillins and have a broad range of activity, including many gram-negative organisms such as Escherichia coli and K. pneumoniae. These drugs are more active than natural penicillins and aminopenicillins because they are more resistant to inactivation by β-lactamase and/or because they more readily penetrate the outer membranes of gram-negative bacilli. Nonetheless, their rate of bactericidal action and the completeness of this effect can be inconsistent. 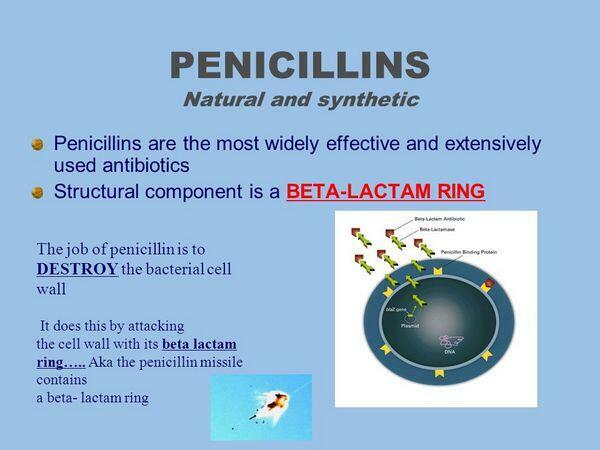 As a class, the penicillins are among the safest antibiotics. However, one potentially life-threatening adverse effect associated with their use is immediate or delayed hypersensitivity reactions. These reactions can present in a variety of forms, ranging from mild skin rash to anaphylactic shock. The overall incidence of hypersensitivity reactions ranges between 0.7% and 10% of patients treated with penicillins. Other more common, yet minor, side effects caused by penicillins are gastrointestinal disturbances (e.g., nausea, vomiting, diarrhea). A growing concern over the past two decades has been the development of bacterial resistance to the penicillins — particularly penicillin-resistant S. pneumoniae (PRSP). 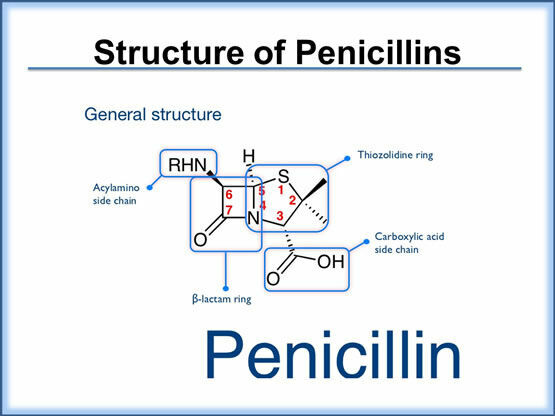 Penicillin drug resistance is caused by production of β-lactamase enzymes and/or changes in penicillin-binding proteins (PBPs) in the cell wall of resistant organisms that result in decreased affinity of the antibacterials to their targets. Because of resistance to penicillins (as well as their dosing schedules and frequency of gastrointestinal side effects), physicians have been switching to newer-generation drugs, such as the fluoroquinolones, that enable shorter courses of therapy and once-daily dosing and have better activity against resistant pathogens. In some cases, however, physicians are using higher doses of penicillins and/or penicillin/penicillinase inhibitors to overcome resistance. Ticarcillin/clavulanate (GlaxoSmithKline's Timentin) is an injectable, extended-spectrum penicillin/β-lactamase inhibitor used in severe, hospitalized community-acquired pneumonia. This agent and piperacillin/tazobactam (Wyeth/Taisho's Zosyn) are used in similar settings; ticarcillin/clavulanate will not be discussed in greater detail. Likewise, ampicillin/sulbactam (Pfizer's Unasyn), an injectable aminopenicillin/β-lactamase inhibitor, will not be discussed further; this agent's activity against gram-positive and some gram-negative organisms is similar to that of amoxi-cillin/clavulanate. Penicillins and related β-lactam antibacterials bind to PBPs in bacteria and prevent bacterial cell-wall formation. The PBPs are enzymes that reside on the inner wall of the bacterial cell membrane and help to maintain the cell wall homeostasis, including structural integrity, cell shape, cell division, capsule synthesis, phage resistance, and regulation of autolysis. The β-lactam ring of penicillins interacts with PBPs and inhibits cell-wall synthesis, thereby killing the cell. Organisms that are metabolically inactive or lack bacterial cell walls (e.g., Mycoplasma) are not susceptible to β-lactam antibacterials. Amoxicillin (GlaxoSmithKline's Amoxil, generics) is aviailable in capsule, tablet, and oral suspension formulations. This aminopenicillin is active against gram-positive organisms and some gram-negative organisms, such as H. influenzae strains that do not produce β-lactamases, but not against K. pneumoniae or P. aeruginosa. Amoxicillin has been commercially available since 1974 and continues to be a valuable therapeutic agent for the treatment of many bacterial infections. It is used as a first-line agent in the treatment of mild-to-moderate community-acquired pneumonia if self-resolution is likely and no other risk factors are apparent. As a β-lactam antibiotic, amoxicillin binds to PBPs in bacteria and prevents bacterial cell-wall formation. A randomized, double-blind clinical trial compared the efficacy of amoxicillin with that of telithromycin. Four hundred and four adults were randomized to treatment with 1,000 mg amoxicillin three times daily or to 800 mg of telithromycin once daily for ten days. At 17- to 24-day follow-up, the clinical cure rate for telithromycin was 94.6%, comparable to amoxicillin's 90.1% cure rate. Side effects associated with amoxicillin are generally minimal, with some incidence of diarrhea, instances of skin rashes, and, particularly, delayed responses. Hypersensitivity to penicillins is an important adverse event and occurs in about 10% of the population. Amoxicillin is typically well absorbed from the gastrointestinal tract, has a rapid onset and long duration of action, requires less frequent dosing, and has a favorable side-effect profile. As a generically available product, amoxicillin is also relatively inexpensive. At one time, amoxicillin was highly effective against the S. pneumoniae. Unfortunately, bacterial resistance to amoxicillin has increased significantly in S. pneumoniae and in H. influenzae. Consequently, physicians have turned to newer generations of drugs that have a lower resistance potential and are active against these pathogens. Amoxicillin/clavulanate (GlaxoSmithKline's Aug-mentin, Augmentin ES, Augmentin XR, generics) is a combination of amoxicillin and the β-lactamase inhibitor clavulanate. The product is available in immediate-release tablets, extra-strength and extended-release tablets, powder for oral suspension, chewable tablets, and parenteral form (in Europe only). GlaxoSmithKline (GSK) is attempting to retain sales of its amoxicillin/clavulanate franchise with the branded Augmentin XR and ES formulations; generics competition began to erode sales in the United States in 2002. The drug has a broad spectrum of bactericidal activity against many gram-positive and gram-negative microorganisms and has been a favorite of clinicians thanks to its efficacy, safety, and familiarity. The formulation of amoxicillin and clavulanic acid in the combination drug protects amoxicillin from degradation by β-lactamase enzymes that bacteria might release and effectively extends the antibiotic spectrum of amoxicillin to include many bacteria normally resistant to amoxicillin and other β-lactam antibiotics. The antibiotic component functions by disrupting bacterial cell-wall synthesis. At least three randomized, controlled, double-blind, comparative clinical studies and one noncomparative study were conducted in adults with community-acquired pneumonia. In the comparative studies, 582 patients received amoxicillin/clavulanate at a dose of 2,000 mg/125 mg orally every 12 hours for 7 or 10 days; the combined clinical success rate ranged from 86.3% to 94.7% in patients who received amoxicillin/clavulanate. In the noncomparative study to assess both clinical and bacteriologic efficacy, 1,122 patients received amoxicillin/clavulanate 2,000 mg/125 mg orally every 12 hours for 7 days; the clinical success rate was 85.6%. Amoxicillin/clavulanate is generally well tolerated. The most frequently reported adverse effects were diarrhea/loose stools (9%), nausea (3%), skin rashes and urticaria (3%), vomiting (1%), and vaginitis (1%). The overall incidence of side effects, particularly diarrhea, increased with the higher recommended dose. In clinical practice, diarrhea and loose stools are the most frequently reported side effects, but these tolerability problems can be minimized by taking the product with food and rarely result in discontinuation of treatment. Other, less frequently reported reactions include abdominal discomfort, flatulence, and headache. The low propensity of amoxicillin/clavulanate to select resistance mutations and a favorable pharmokinetic profile predictive of high bacteriologic efficacy may account for the longevity of this combination in clinical use. However, in certain defined geographical areas, the emergence of S. pneumoniae strains with elevated MICs (i.e., lower susceptibility to the agent) has been observed. To treat drug-resistant S. pneumoniae, high-dose amoxicillin/clavulanate formulations have been developed that are active against some resistant bacterial strains. An enhanced tablet dosage form of amoxicillin/clavulanate (2,000/125 mg twice daily [GSK's Augmentin XR]) has been developed for use in adult respiratory tract infection. This enhanced formulation prolongs the time that bacteria are exposed to the antibiotic and promotes coverage of tough-to-treat S. pneumoniae with reduced susceptibility to amoxicillin, β-lactamase-producing H. influenzae, and Moraxella catarrhalis. β –lactam/β-lactamase inhibitor combination therapy, the latter protects the antibiotic from degradation by β -lactamase enzymes released by bacteria, thereby extending the effective spectrum of the therapy to treat bacteria resistant to the β-lactam antibiotic treatment alone. Like other β-lactam therapies, piperacillin/tazobactam achieves its bactericidal effect by interacting with PBPs and disrupting bacterial cell-wall formation. Piperacillin's broad range of activity (which includes many gram-negative organisms such as P. aeruginosa and K. pneumoniae) is enhanced by the β-lactamase inhibitor tazobactam, which effectively extends the spectrum of activity to include H. influenzae. Piperacillin/tazobactam is used for severe and/or complicated community-acquired pneumonia episodes in hospitalized patients in whom broad (gram-negative) coverage is required. An open-label, randomized, multicenter study compared piperacillin/ tazobactam with amoxicillin/clavulanate for the treatment of severe pneumonia in 84 patients. Investigators reported a 90% favorable clinical response rate with piperacillin/tazobactam and 84% with amoxicillin/clavulanate. In a second randomized, open-label, controlled study, piperacillin/tazobactam was significantly more effective than ticarcillin/clavulanic acid in terms of clinical and microbiological outcome in patients with community-acquired pneumonia. For at least 5 days, 177 patients received piperacillin/tazobactam (3 g/375 mg), and 122 received ticarcillin/clavulanate(3g/100 mg), every 6 hours by IV infusion. Favorable bacteriologic response rates at follow-up were 91% and 67%, respectively. In clinical trials of piperacillin/tazobactam, 90% of the adverse reactions were transient and mild to moderate in severity. The most significant side effects reported include skin rashes/pruritus, gastrointestinal complications (including diarrhea, nausea, and vomiting), and allergic reactions in 1.3%, 0.9%, and 0.5% of treated patients, respectively.